If your doctor recommends an NSAID medication to help ease your arthritis pain and inflammation, they will take many factors into consideration to determine which particular NSAID is appropriate for you. There are more than 20 approved NSAIDs available in the U.S. Some are available over the counter and are likely familiar to you (aspirin, ibuprofen, and naproxen). Other, stronger NSAIDs are available only by prescription (such as meloxicam or celecoxib). Because NSAIDs come with several dose- and duration-dependent side effects — some serious — your doctor is most likely start you on an over-the-counter NSAID, says Rawad Nasr, MD, division director, rheumatology, at Hennepin Healthcare in Minneapolis. “I’ll begin with ibuprofen or naproxen, and if the patient doesn’t get relief, then I’ll consider prescription NSAIDs,” he explains. Keep in mind that if one NSAID doesn’t work very well for you, another might do the trick. So you may need to try a few before you find the one that’s best for you. 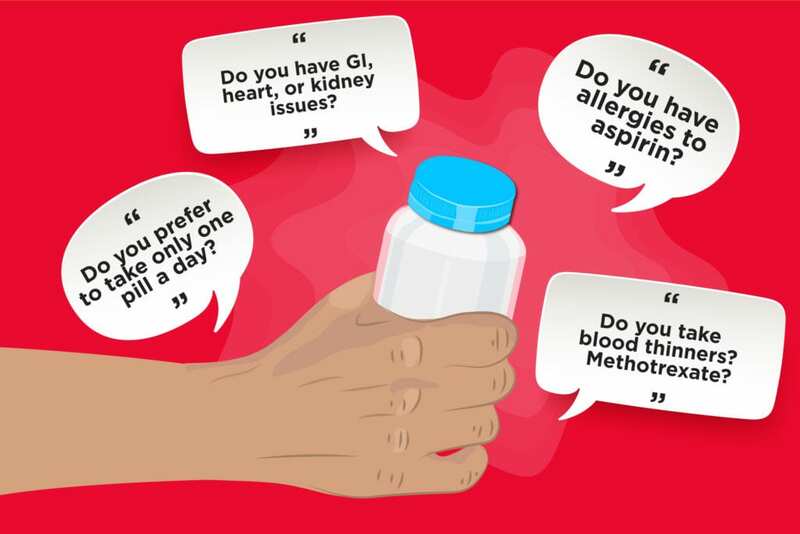 What else determines which NSAID may be your ideal match? Here’s what doctors need to consider before making their choices. If you have any gastrointestinal illnesses — such as a history of ulcers — that may influence which NSAID your doctor chooses, or whether he or she prescribes one at all. That’s because NSAIDs are notorious for irritating the stomach, causing side effects such as stomach pain, diarrhea, and nausea. In some cases, patients may develop ulcers, which may burst and lead to life-threatening bleeding. While the chance of developing serious GI problems is more dependent on the dose and duration rather than the type of NSAID used, studies suggest that certain ones may be more likely to cause GI complications than others. Ketorolac, aspirin, and indomethacin are associated with a higher risk of GI problems, while ibuprofen, meloxicam, and celecoxib (Celebrex) may be less likely to bother your stomach. Your doctor may recommend certain prescription NSAIDs that combine pain-relieving ingredients with others, such as acid reducers, to help reduce stomach irritation. Expect your doctor to also take a close look at your heart health and your family history of heart disease. All NSAIDs — with the exception of aspirin — are associated with a small risk of cardiovascular issues such as heart attack, stroke, and high blood pressure. (Aspirin is known for having a protective effect on the cardiovascular system.) Those risks increase if you’re on a high dosage, take NSAIDs for a long period of time, or already have established heart disease. “If someone has cardiac disease, I try to avoid using NSAIDs at all,” Dr. Nasr says. Should you have risk factors for heart disease — such as high blood pressure or high cholesterol — or a strong family history of heart disease, NSAIDs aren’t necessarily off limits. Your doctor may opt to put you on naproxen, since some studies suggest it has less of an impact on the heart than other NSAIDs. Aspirin may also be an option, provided you’re not already taking a daily low-dose of it for its cardiovascular benefits. Another important aspect of your health to consider is your kidney function. NSAIDs reduce blood flow to the kidneys, so if you already have decreased kidney function or kidney disease, your doctor may not recommend them. If you take blood thinners such as warfarin or heparin, your doctor won’t recommend NSAIDs because combing NSAIDs and blood thinners increases your risk of serious bleeding. Doctors also need to cautious when recommending NSAIDs to patients with inflammatory forms of arthritis who take methotrexate, Dr. Nasr says. “NSAIDs can increase the amount of methotrexate that stays in your blood, so if you start taking one your doctor may need to adjust your dose of methotrexate,” he says. If you’re already taking low-dose aspirin for cardiovascular protection, Dr. Nasr says you may be able to take another NSAID with it, but that raises your risk of GI problems. Your doctor may also want to use caution if you’re on antidepressants, specifically selective serotonin reuptake inhibitors (SSRIs) such as Prozac and Paxil. Taking them and an NSAID may increase the risk of bleeding. If you have a sensitivity or allergy to aspirin, your doctor will be very cautious when prescribing other NSAIDs. If you have a true allergy to aspirin and have developed life-threatening symptoms from it such as anaphylaxis, then it’s best to avoid all other NSAIDs, Dr. Nasr says. If you don’t like taking many pills — or you tend to forget to take them — your doctor may recommend a long-acting NSAID.